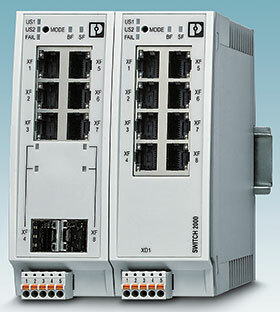 With new Profinet functions and versions for the Factory Line Switch 2000 product family, Phoenix Contact has extended its range of managed switches for Profinet automation applications. After a firmware update, the version 2200 and 2300 switches support Profinet device functionality and Profinet conformance Class B. With this, the devices will be integrated directly into the engineering system (PC Worx or TIA portal) as Profinet components, and configuration and diagnostics functions can be performed via a controller. It is also possible to perform rapid diagnostics in the event of error states or failures in the connection to the controller directly at the switch, thanks to special status LEDs with the 2200 PN and 2300 PN versions. Furthermore, the user no longer has to configure the devices for use in Profinet networks because they are supplied already configured with the Profinet mode.